Paris – New York – Shanghai : a book about the past, present, and (possibly) future capital of the world. Eijkelboom, Hans. New York : Aperture, c2007. Hans Eijkelboom’s book Paris – New York – Shanghai is subtitled “A book about the past, present, and (possibly) future capital of the world.” In it, Eijkelboom showcases the end (or near-end) result of his “Photo Notes,” where the photographer would head into each town and photograph as many of certain type of people (people carrying kids, cops, guys wearing striped polo shirts, business women on their morning commute) within the space of about two hours. The final product is a book that is really three books. There is a separate volume for each city, but they are bound together in sort of a tri-fold format, which allows the viewer the choice of viewing each book separately or folding the whole thing out to do a city-by-city(-by city) comparison. There are no captions anywhere in the book—the only explanation comes by way of a short essay included in the front pocket– but it soon becomes apparent that the format of each ‘volume’ is exactly the same, with each group of photos presented in exactly the same order in each city. Though the individual photos aren’t particularly spectacular alone, when grouped together they have a huge impact, as they both anesthetize the reader to the realities of city life (much in the same way that actually living in the city would) and provide the reader with startling photographic evidence of the creeping homogenization of the world we live in. Fénéon, Felix. Novels in Three Lines. New York: New York Review of Books, 2007. In 1906, French anarchist, art critic, and former clerk Felix Fénéon went to work for Le Matin, a Paris broadsheet, where he wrote the small news clips known as “faits divers” – sometimes translated as “hard facts”. Never more than a few lines, they covered the outliers of the everyday: oddities, obituaries, and accidents. Today, we would call these “Short Takes” or “News in Brief” and they’d be in a sidebar or tucked away on A17. The sinister prowler seen by the mechanic Gicquel near Herblay train station has been identified: Jules Ménard, snail collector. There isn’t much to say, to add, to this work. Fénéon himself wrote anonymously, these stories saved only by the attention of his mistress who clipped them from the paper. He never published any of his own work in his lifetime, despite being closely tied to the vibrant intellectual culture of Paris and championing artists like Georges Seurat and Paul Signac. It stands to reason that one could easily read these works as trifles or period pieces. Just as easily, however, can they sit with Nietzsche’s aphorisms of The Gay Science or Stein’s poetic experiments of Tender Buttons. And by way of final recommendation, allow me to direct you toward the Fénéon Twitter feed, which is, in its own way, nearly perfect. Publisher Number: [S.l.] : Classic Collection, c1998. If you love mysteries, Victorian period pieces, or horror of an implied nature, then I have a film for you. 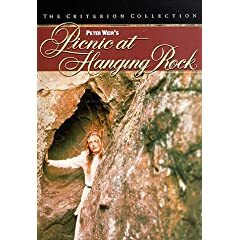 Picnic at Hanging Rock is an Australian film directed by Peter Weir, released in 1975. The film closely follows the book of the same title by Australian authoress, Lady Joan Lindsay. It’s St. Valentine’s Day, 1900, rural South Australia. A party of upper class school girls and two teachers, from Appleyard College, are taking a day trip to Hanging Rock. The field trip ends in tragedy, when three girls and one teacher mysteriously disappear somewhere on the rock. To avoid spoiling the mystery, that’s all I will reveal plot-wise. The narrative itself is worth the viewing, but the film has much more to offer. Picnic at Hanging Rock is an excellent interpretation of Victorian ideals and attitudes, and how ill-suited they were to rural Australia. Besides, all those pious, pretensions, unnatural and restrictive social rules of conduct, prove to be fertile ground for horror and high tension. The ever present portraits of Queen Victoria loom down from practically every corner of the Appleyard School. The constant pressure of potential impropriety builds upon itself, infecting the school, the town, and everyone affected buy the disappearances. Australia is key to the story. It could also be considered a character onto itself, perhaps even a corruptible element. Many ambiguous avenues are explored, including the supernatural. This is definitely the kind of film that leaves you with more questions than it answers. The film is not without it’s over-the-top moments. A few hysterics almost seem appropriate though, when portraying a tightly wound, oppressive culture. Trying to enforce the confined, restrictive, Victorian ideals of England on a landscape as vast and wild as Australia, proves ultimately to be a lost cause. Beautiful landscapes aside, photography is utilized to its greatest advantage throughout the film. Images are used to set the stage as well as convey narrative and mood. Costumes and set pieces are spot on, making it easy for the viewer to dissolve into the past. Hanging Rock is an actual geological formation about an hour north of Melbourne. Lady Joan Lindsay was herself a privileged school girl in Melbourne in the early 1900’s. She is known to have based Appleyard College on her own school girl remembrances. Even though the narrative is pure fiction, the historic everyday details feel quite true to life. It’s also worth mentioning that this was one of the first Australian films to enjoy international distribution, with both acclaim and commercial popularity. Picnic at Hanging Rock is so beloved that it is still screened annually on the grounds at Hanging Rock, Victoria, on St. Valentine’s Day. You are currently browsing the Library Lagniappe blog archives for June, 2009.